A large chunk of my childhood at home was spent watching Disney classics such as The Little Mermaid, Aladdin, and Snow White. The latter is one of my favorites because of the magic in its story and the tale of good triumphing over evil. Its multidimensional characters also hooked me to the story. With that said, it is no surprise that I am more than stoked when I received an invite from Ballet Manila to attend the world premiere of Lisa Macuja-Elizalde’s Snow White. 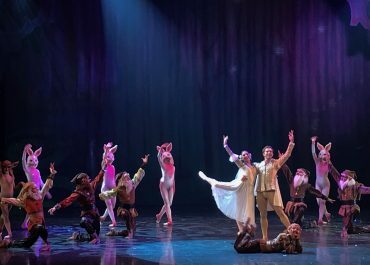 Ballet Manila continues to astound in their 22nd Performing Season labeled, Flights of Fantasy with Snow White. Katherine Barkman graced the stage as the titular character in the world premiere alongside Abigail Oliveiro as The Evil Queen. Joseph Phillips also joined the cast opposite Barkman as the Prince. Godwin Merano plays as the enchanting yet creepy Witch in the Mirror. The moment the show started, it was as if the country’s premier ballet company told the audience that they just keep on getting better and better with every production. Snow White resonated a striking contrast to Don Quixote, Ibong Adarna, and Swan Lake, while also taking bits from each. It had the brilliance and originality of Ibong Adarna, the vibrancy of Don Quixote, and the beauty of Swan Lake. The performers brought performances nothing short of brilliance. Barkman captured the naivety of Snow White, making an endearing presence on stage. Her gracefulness brought the beloved character to life. Meanwhile, a hero is not complete without a villainess and Oliviero’s Evil Queen is a total scene-stealer! If you would have guessed by now, I am the type of audience who usually roots for the bad guys. Oliviero’s movements were perfect! She is cunning, carefree, and overall a delight to watch! She and Barkman create the perfect harmony whenever they are on stage at the same time! The show is presented in two acts. Both acts stood out on their own. Ballet Manila’s vision for the production is to highlight the story and do that, it did! The company upped the production value this time. Mio Infante created a magical scenery for the play, backed by the great lighting by John Batalla. Both elements elevated the narrative- creating a more engaging and powerful story. Michael Miguel shared his craft in providing elaborate costumes for the characters- Snow White, the Evil Queen, the Prince, the dwarves, and even the forest animals! Wrapping everything up is Von de Guzman’s music. These elements worked perfectly and created, which I called, Ballet Manila’s most spectacular performance yet. Yes, the past productions are great on their own- Ibong Adarna stunned me with its originality and Swan Lake made me emotional with its beauty but Snow White is one-of-a-kind. It reminded me of the young innocence of the beloved tale- the magic, romance, and fantasy. Truly, Ballet Manila continues to soar this 22nd performing season with Liza Macuja-Elizalde’s Snow White. PREVIOUS POST Previous post: iflix Produces First Stand-up Comedy Series, "Hoy! Bibig Mo." NEXT POST Next post: Be the Best Bestfriend This Christmas!